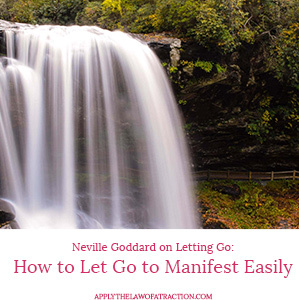 Neville Goddard took a very simple approach to letting go. Neville didn't need to obsess over the things he wanted to manifest. He didn't constantly visualize or think about what he wanted to create. You become for a moment, after a successful meditation, incapable of continuing the act, as though it were a physical creative act. You are just as impotent after you have prayed successfully as you are after the physical creative act. When satisfaction is yours, you no longer hunger for it. If the hunger persists you did not explode the idea within you, you did not actually succeed in becoming conscious of being that which you wanted to be. There was still that thirst when you came out of the deep…. Neville knew that if he visualized his scene correctly to manifest his desire, he would automatically let go of his desire. He would have a feeling of satisfaction – a feeling that he had already achieved his desire. He didn't need to look for signs that his desire was manifesting. He had already experienced the feeling that it was real, and that was enough. Neville didn't visualize to try to change his physical reality. He visualized to create the feeling of having manifested his goal. As Neville went about his day, he understood that his job was to train his mind to focus on living from the state of his wish being fulfilled. His job wasn't to think about his desire or about his current life. His job was to live from the feeling of already having manifested his desire. When he achieved and lived from that feeling, Neville was detached from the outcome. He knew that the world would transform around him to match his state of being, or imagination as Neville called it. When you're thinking about your desires or your current life, you create anxiety, doubt, and obsession. You focus on wanting something to happen and wonder how it's going to happen. These both imply that it hasn't happened. They also cause you to try to control the outcome and make things happen (the how) – which is the Universe's job, not yours. Pruning your thoughts (or vines) occurs when you notice that you are thinking about something. You may be worried that something won't happen or fearing that the worst will happen. You may even be running past conversations through your head wishing you could have said or done something differently. 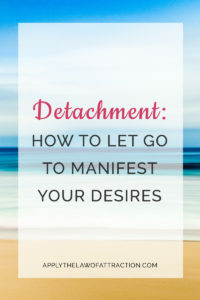 When this happens, you want to prune your thoughts and intentionally shift your attention so that you feel, see, and think from the point of your desire having already manifested. It's no longer something you're hoping will happen or wanting to happen. It isn't something that is happening. It has happened. It is real NOW! Neville understood that letting go occurs when you are at one with your desire – when you live as if it is already yours. Letting go is true detachment. There's no worry, fear, or obsession. You trust that it's yours because you know that it is. The evidence is already within you and in your life. It doesn't matter what the world says. All you have to do is let go by assuming the state of your wish fulfilled. What If You Were Your Own Soulmate? Oh my… For over a month I was focusing on manifesting something I really really want. It didn’t manifest but I didn’t give up. I couldn’t blame the Law of Attraction. It was me constantly creating more resistance. I’ve read a lot about manifesting but felt I was missing something. Then one day I read Neville’s book and it changed my life. Last night before I went to bed I read the words you are quoting here. I couldn’t believe it. All day I think about that book, that one specific chapter, and here it is again! I know I can manifest my desire and will apply what I’ve learned here. I just need to create the feeling of the wish fulfilled and find a way to ‘deny the assumptions of the senses’. I can visualize and see what I want through my own eyes in my imagination but the feeling isn’t there. But I’m not giving up! Keep moving towards the feeling and you’ll get there, Aj! I have a problem: I have searched over Law of Attraction (Most of them from your website; Thank you 🙂 ) but I think it’s now enough! In fact, I think I don’t know enough about Law of Attraction to bring it to my life. I know I have to ask; I love the visualizing for this step. I know I have to FEEL it everytime I visualize. I do it good. I meditate at least three times a day, 2-3 minutes, focus on my breathing, then, after my mind calmed down, I visualize, feel that situation (my dream), and really have a feel of joy. But I don’t know why I am such nervous. With the LOA, whit this feeling(! ), I know I am attracting “Not knowing enough to use this law!”. I’m nervous. I search a lot about this law. For example, watching videos (YouTube) from Napleon Hills, Abraham Hicks, Joel Osteen, Burt Goldman, even anonymous people! They all says the same. So what’s wrong with me? I know it’s a kind of resistance but how can I destroy it? Because waiting creates a feeling of lack! I thought that book is not for me; Because I have my love right now! But thank you for your comment; I’ll try that too! I have a question.. Can it be too late to attract a specific person? Because I haven’t talked to him for a month now and I don’t know if it’s too late..
Is it possible to attract a person we love one sidedly using loa techniques? Even if we dint attract , we’ve to atleast reveal them we love them., right..! Can we get such situation atleast? Thank you soo much Elizabeth for this article it was my missing piece. I’m so greatful I found your website and your book! Bought it 4 days ago and I’ve been doing everything you say there, so I KNOW I’m already with my boy again! Your book is great! Read it almost 4 times in 3 days! It’s so positive and made me calm, peaceful, confident and happy (when I was really down and desperate – but that’s past!). I have a question: do you think it’s bad if we tell someone we are living “as if”? I mean, should we keep it only to ourselves? Thanks Mrs L! I’m so glad my book has been able to tell you. I think the answer to your question is “it depends.” It depends on the you and the person you tell. Do you think they’ll support you or not? Will they make comments that can lower your vibration? If they were to say anything, would you be affected negatively by it? If you think they’ll lower your vibration, weaken your belief, or cause any other negative emotion, it’s probably best not to tell them. The book is Manifesting Love. About 2 months ago, one guy appeared in my life and we both hitted on each other. He kissed me on our first date. He texted me at night inviting me to his apartment to watch movies and shows. We usually watch a movie together at his apartment and then make out. Then that’s it! And the times he texted me is decreasing and recently he told me that he didn’t really want a relationship and just wanted to hook up. But I really want a relationship with him and felt hurt that all the time that we spent together leads to nothing. I really want a relationship with this guy and not just hooking up. What should I do with Law of Attraction to be in a relationship with this guy? Thanks! Thank you for this article! The letting go they way you describe is something I have been trying for a while now. Every time I feel so aligned with my desire, something happens and pulls me right back. I have read your book manifesting love, because I wanted my ex back. It’s been two months or even longer since I have read your book and I haven’t manifested my ex back. Every time I am detached from the outcome I manifest something else. I feel perfectly happy at the moment, there is no need but I do love my ex. However, every time I feel good, I run into him with another girl. That sets me back, it always gives me the feeling I want to give up. In the meantime I also dated this other guy and like him, but that also didn’t work out. Did I confuse the universe by dating someone else? Why do I have an outcome like this? I don’t want to put my life on hold, just want to continue my day. I trust the universe to bring me my true love. Based on the information you provided, it’s hard to say why you’ve had the outcome you’ve had. Depending on what you were doing Law of Attraction-wise while you were in a relationship with someone else, you could have confused things by consciously or subconsciously blocking a relationship with him. If you want to be with one person, but you’re thinking about how great another person is, things can get confused and both people can pass out of your life until you get clear on what you want. You have successfully manifested your ex in that you keep running into him. Perhaps you haven’t been specific enough or are inconsistent with your vibration (i.e., sometimes you send out the energy of being in a relationship and other times you send out the energy of not being a relationship). When you see him and become disappointed, etc., you’re sending out negative energy. Instead of seeing it as a failure, you should acknowledge that you have successfully manifested him (i.e., you did run into him after all), be grateful and allow more to happen. What if you ran into him as a way for the Universe to ask you if he was really what you wanted? When you became upset, you told the Universe that you didn’t want him. Thank you so much elizabeth for taking your time to reply to my post. It helps me a lot. U see it’s not difficult for me to manifest him, because we are sort of friends, and I see him at the gym, so I know he is still there. I go back and forth when it comes to my feelings for my ex. Although I love him, it was a difficult relationship, since he is a insecure and unhappy person and indirectly that had a lot of effect on me. So maybe, I haven’t manifested him back, because deep down he hurt me too much. When i see him with this other girl, I get reminded of all the hurt. I just can’t block it. In the mean time, the other guy unexpectedly ran into my life, I’ve known him for years, but not really well. I like him, but I was fighting these feelings from the beginning. So I tried to keep my distance because i didnt want to get hurt again and by the time I realized I do like him, he pulled back. So you made me realize that going back and forth in my feelings doesn’t manifest either of them. I have to get clear what i want first. Thank you so much again. I do love your book and I believe that it works! Thank you so much for your website, Elizabeth! The law of attraction really works because when I try to know about Law of attraction, I discovered your web site. It’s really usefull, but I have a question: when I use the Law of attraction, I fell like I have what I want, but when I come back my reality, I continuing fell bad and nervous. Please help me. Thanh you. 1. Apply the tips in this article. They will help. 2. Search this site for articles covering nervousness. Hello! I purchased your book. Thank you for everything so far! I’m currently manifesting my last boyfriend back. For letting go, is it okay to date other men and be on online dating sites when I want to be with my ex boyfriend? It’s like, I want my ex boyfriend but to let go, I think dating again will really help me. Then I get confused. Thank you for your advice! It depends on the person. Some people are okay dating other people, some people are not. You need to see what works best for you and if dating causing any issues to come up for you. I still don’t understand how I’m supposed to act as though I already have a relationship with my dream guy if I’m still single this really confuses me a lot.